The highlight of the Kendata Peripherals stand at this year's NAPC exhibition was the latest version of the Southampton based company's DCAM archiving software module, which eliminates the need for primary care centres to store thousands of paper-based documents. Designed to operate as part of Kendata's Information Archive Server system, the DCAM module frees up valuable office storage space by offering a simple and cost-effective means of filing, searching and rapidly retrieving patient documentation. DCAM provides specially developed input screens to suit the needs of primary care centres, resulting in an intuitive archiving system that incorporates features normally only found on significantly higher priced products. As documents are scanned, DCAM allows the user to allocate a reference to each image, together with searchable notes. 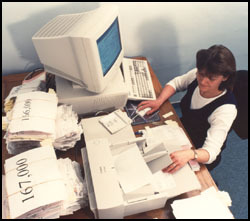 An OCR option enables the referencing to be carried out automatically. All information is then stored with a record of the time and date of scanning, which simplifies retrieval and allows for later audit, ensuring that the highest integrity is maintained. Standard browser-based retrieval reduces installation time and keeps training to a minimum, with documents being easily viewable on PCs, Macs and other platforms. The DCAM software indicates when an archive CD needs to be written and automatically creates two CDs - one master and one copy for storing off-site.